From the Kitchen Dept. Better cookware for your plant-based kitchen is perhaps not mandatory, but it makes life a hell of a lot easier. There really are few special requirements for the plant-based kitchen. For me, the biggest thing has been that I became more critical than ever in choosing knives. And I keep them sharp better than I ever have in my life. Plus, I swear by rice cookers. 3-cups – ideal for 1 or 2 people. I like the Zojirushi NP-GBC05. 5.5-cup – ideal for a normal family 3/4 people, see the Zojirushi NP-NVC10. 10-cup – ideal for 6-8 people, see the Zojirushi NP-NVC18. I mention Zojirushi only because I have had such excellent experience with them for a long time. Recently a lot of people are in love with Instant Pot. At this moment I have no space for it, so, at least for now, I am making do without, and I still think the rice cooker would be my first choice – I practically use it once or twice a day and sometimes even three times. When it comes to pans, for cooking without oil, a certain level of non-stick quality helps. Generally, any good stainless steel pan will do. I have a good set that after forty years still looks like new, Demeyere Silvinox, the Venus series, which were especially designed to cook vegetables in their own juice without the need for oil or water and they are brilliant. The only thing they don’t give me is a bottom that is suitable for induction heat. Plus, I ruined the bottom on the largest Dutch Oven in that set at one time due to serious overheating. As a replacement, I recently got one of their Atlantis series pans, the 4.2 Quart Dutch Oven, which works with induction heat – in fact, it is as efficient as any pan I’ve tried, and provides more even heat than most. Absolutely recommended, I know from experience it will last a lifetime. It may look like a typical cookware set, but these stainless steel products have a special power: they’re designed with technology that allows for healthy vapor cooking, which heats food faster and at lower temps, locks in flavor and nutrients and eliminates the need for added oils or fats. That says it all. The pricing is in line with the Demeyere pans. It is all induction capable. Another good option, which I have not personally tried, seems to be Made In Cookware. Worth checking out, if you ask me. Pricing is quite reasonable, and it seems to have high conductivity, and is completely induction capable. 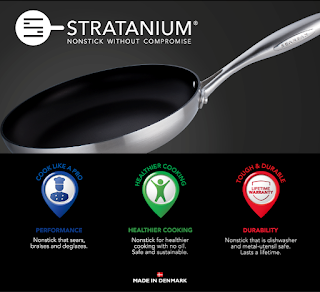 They have both stainless steel and non-stick varieties. For the non-stick they state you can absolutely cook without oil or fat, and it is induction compatible. The one thing to know in non-stick is that some of the coatings have become suspicious from a health standpoint, because they do wear off, and some of the materials are definitely not healthy, particularly the ones with PTFE (Tefloon) and PFOA, according to this report from the American Cancer Society. The best advice seems to be to throw them out. There are a number of newer materials, and particularly some of the ceramic ones seem to be very good. Here is a great review site on these types of cookware, the Organic Authority. One thing we did try recently was the CopperChef pans. From them, I got my first Induction heat cook top (my rice cooker already works with induction heat). I love the cook top, but there are many other choices besides CopperChef. Theirs is a 1,300 Watt model with all the basic functions, and pretty convenient to operate. To me the key feature is the better temperature control and the timer, which truly make life easy. There are many other choices in induction cooktops, here is one with 15 temperature settings and 1,800 Watt, Secura 9100MC. The CopperChef pans are nice enough to use, but I don’t think they wear very well, first of all the ceramic coating does wear off on the bottom from just the friction with the cooktop. Secondly, since these are rather thin aluminum pans, the heat distribution is not great, and in the central area, where the heat comes in, things will stick to the bottom and gradually the non-stick feature is becoming compromised and, for me, that became most evident in their 9.5″ Deep Square Pan, which I used daily for nine months, before I replaced it. This is in spite of the fact that they specifically claim on their website that you can cook without butter or oil because of their non-stick quality. 7. Do I need to use any butter or oil? The Copper Chef Deep Dish Pan is the first of its kind designed with Advanced Cerami-Tech Non-Stick Coating. There’s no need to add any extra butter, grease, or oil. For added flavor, you may season the cooking surface with natural oils such as olive, canola, or peanut oil. Also, the edges are sharp and that is another place where the coating wears off almost immediately. Overall, the build quality is cheap, more army surplus than kitchen gear. Nevertheless, as long as it will last, I like cooking with them, but like I am saying here, it seems to deteriorate, so these pans will not last too long. On top of the quality problems, the company has been an absolute disaster to deal with. Our initial order arrived incomplete and it took a number of reorders and returns of wrong items before we received exactly what we had ordered. I would not buy from them again for that reason. I have a griddle from the same company, which I have used to roast some peppers, and almost immediately it began losing it’s non-stick properties gradually, right from the first use. Again, that indicates this coating does not stand up to use. On the whole, I would say avoid. This stuff is over-hyped and not worth the money. ScanPan is one brand about which I heard good reports in the plant-based community. It is made from recycled aluminum, with a ceramic non-stick coating, and it has great conductivity and even heat distribution. I have replaced my CopperChef 9.5″ Deep Square Pan with a 4 Qt Scanpan CTX sauce pan, which is the perfect size for one person to cook things like spinach, all the way from caramelizing some chopped onions and garlic to table ready spinach for one or two people. It has proven to be an amazing product. For good measure, I also got the 9.5″ Scanpan CTX frying pan. Another worthy expansion of the arsenal! That pretty much sums it up for the cookware department. I don’t pretend to be exhaustive, but these notes are based on some first hand experience and recommendations from within the plant-based community.